The Hickory Adirondack Patio Chair Cover from Classic Accessories is made from durable Weather10 material featuring a rugged fabric outer layer with a laminated waterproof and wipe-clean inside coating. Weather Leather trim looks authentic but wont rot. Covers Adirondack chairs up to 33.5 L x 31.5 W x 36 H.
The tough, stylish fabric of the Terrazzo patio furniture cover collection protects against rain, snow, sun and dirt and won't crack in cold weather. An elastic cord in the bottom hem provides a fast and custom fit. This patio chair cover fits chairs with backrests up to 20-inch high. Gardelle protective fabric system offers beauty on the outside and protection on the inside. Features a fabric top with a water repellent and water resistant inside coating. The debossed, patterned trim adds texture and design to the heavy-duty fabric. Tough seams add strength and durability. Click-close straps close over the legs to secure your cover on windy days. Fits round table and 6 standard chairs up to 94-inch diameter. Ideal for use in moderate to harsh weather conditions. Duck Covers Elegant Series patio furniture covers are designed to protect patio furniture from dust, dirt, sun, rain and heavy snow. Manufactured using a combination of high-strength polyester top panel, plus innovative, multi-layer, breathable side panels to help eliminate condensation. The multi-layer, breathable side panels eliminates the need for vents and provides additional cover height. High-strength polyester base for added durability. Swiss Coffee color. Two-year limited warranty has you covered. Migrate to Duck Covers today! 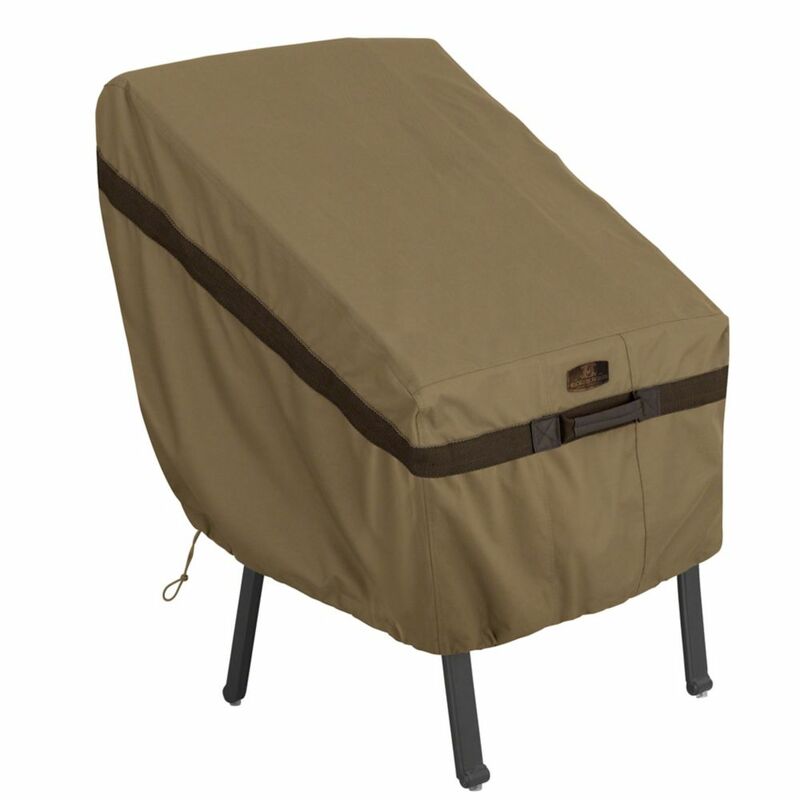 Hickory Adirondack Chair Cover The Hickory Adirondack Patio Chair Cover from Classic Accessories is made from durable Weather10 material featuring a rugged fabric outer layer with a laminated waterproof and wipe-clean inside coating. Weather Leather trim looks authentic but wont rot. Covers Adirondack chairs up to 33.5 L x 31.5 W x 36 H.
Hickory Adirondack Chair Cover is rated 4.8 out of 5 by 6. Rated 5 out of 5 by Ginger from Perfect. ... Perfect. Rated 5 out of 5 by Tina from Would buy this product again Ordered this product online, it arrived yesterday, we are so happy with the quality, it is well made. Highly recommend this product. Rated 5 out of 5 by SmW from Great fit. Heavy duty fabric and fasteners. Recommend. Nice, heavy duty fabric. Have to see how it goes thru some northeast summers/winters Fit is great. Easily covers six stackable chairs, just right. Rated 5 out of 5 by BernieinNv from Top quality and best guarantee anywhere I have used other products from Class with great result and decided for our new home and outdoor furniture to cover them with this top of the line model for our built in bbq, table chairs, and 6 bar chairs. They look really great. Hopefully will take the sun but then again , the have a lifetime warranty so worth the risk of paying more.